For general performance info and pricing click here. How do I book a performance? First call or email with the day and time of your event to check the availability of the time slot. If Sahina is available your event will be penciled into the schedule. Then all you need to do is sign the performance contract and submit it with a 50% deposit and you are booked! Your event is not booked until the contract and deposit are received. Contracts and deposits help ensure that your event turns out exactly as you envision it. The deposit is non-refundable. Deposits can be paid via check, credit or debit card, or paypal. How far in advance should I book a performance? How far in advance you need to book depends on the time your event is being held. During weekends, holidays, and wedding season it is best to book a performance a month ahead of time. Last minute performances can occasionally be scheduled if Sahina's schedule is not already full. If you are booking more then one dancer please schedule at least two weeks ahead of the event. A signed contract and 50% deposit are required to confirm the booking of any performance. 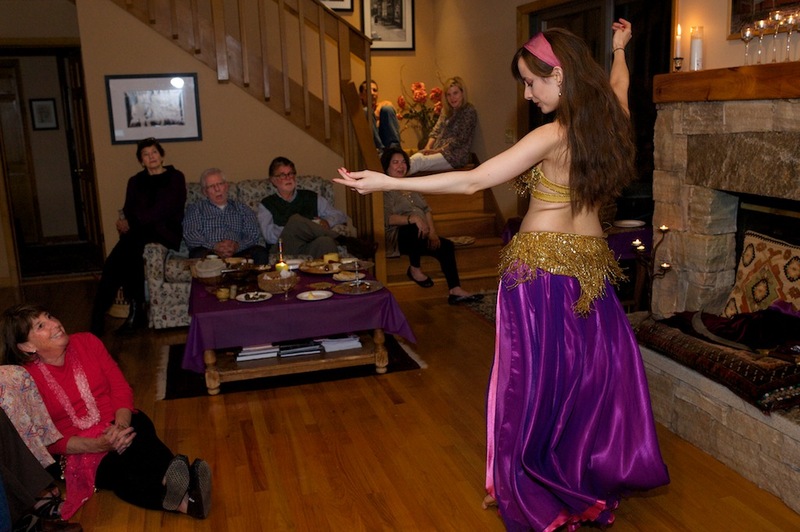 Are bellydance performances family friendly? Yes, absolutely! Bellydance can be enjoyed by people of all ages and children often love to get up and dance as well. Sahina does not perform for bachelor parties or other all male events. Is it appropriate to tip a bellydancer? Yes, tipping is appropriate and can be a great way for the audience to be involved in the performance and to show appreciation for the dancer. Tipping is generally done as a 'money shower' where tips are thrown on the floor during the performance or handed to the dancer during or after the show. I am interested in booking a performance for a charity of non-profit event. Is the price structure the same for these events? Charity benefits and non-profits looking for a discounted or donated performance are assessed on an individual basis. Sahina donates a select number of performances to charity each year. Please email for more information. We would like you to wear a more conservative costume for our event, is that possible? Sahina has a wide variety of costumes and can wear dress or traditional folkloric costuming that covers her arms and belly. If you would prefer that she wear a more conservative costume for your performance please specify during booking.